There are some people that are old enough to remember back in the old days when a garbage disposal was more of a luxury item that was in newer homes. Today, the garbage disposal is much more common. In fact, there are millions of these waste removal products hiding under kitchen sinks across the country. This has led to the increased need for a top service Garbage Disposal Repair in Phoenix, AZ company like ours to service the units. A garbage disposal unit is the workhorse of the kitchen. It is called upon several times a day to get rid of the waste left after meals in the home kitchen. This waste disposal unit is installed by a plumber between the drain in the sink and the trap. Some people might take it upon themselves to install the unit, thinking that the DIY route is the best way to save money. Think again. 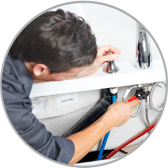 Often, this leads to a number of serious errors in the installation and a plumber is called in to repair or replace the unit. The fact is hat a lot of calls are about incorrectly installed garbage disposal units that require Garbage Disposal Repair in Phoenix, AZ. Other reasons involve incorrect maintenance to improperly using the unit. So, what steps are taken, if the garbage disposal unit is not working properly? Well, it is best to take a look at the unit. Did you overload it? Did you plug it in? Did you hit the reset button? Try turning it off and turning it back on again. Did any of these methods work to get the unit up and running? Well, if not, call our friendly plumbing and home service company for immediate Garbage Disposal Repair in Phoenix, AZ consultation.